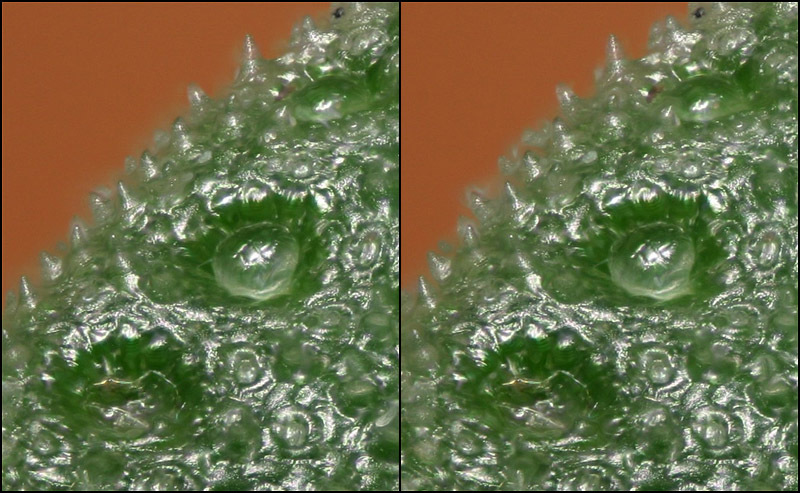 Perhaps not a beautiful subject at this scale, but I happened to pop one of these leaves under a stereo scope the other day and thought it was interesting. 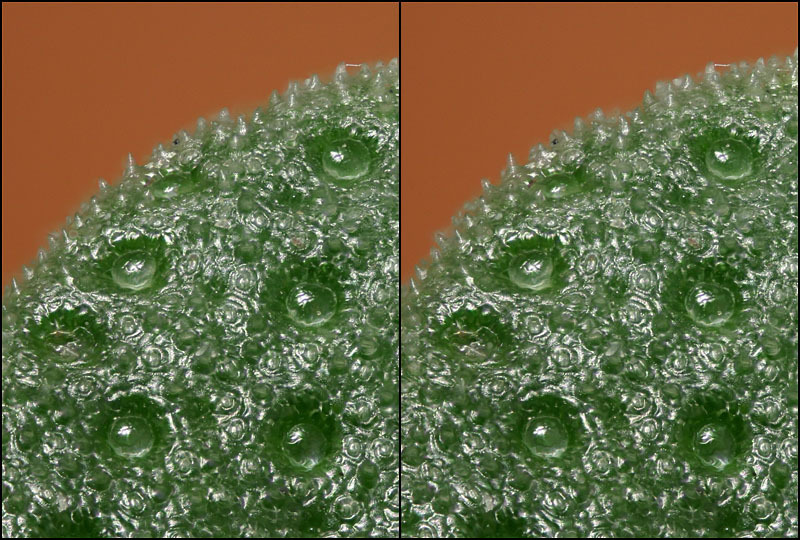 This is the very tip of a leaf, about 2 mm across. A couple of stereo versions. Thyme comes in six essences, or biochemical phenotypes, all produced by a single biochemical pathway. The genes controlling the biochemical pathway are variable, and that variation causes each plant to produce just one of the six monoterpenes: geraniol, linalol, terpineol, thuyanol, carvacrol, or thymol. The structural differences among these monoterpenes determine not only the essence or fragrance of each plant, but also the efficacy of both defense and attraction. The 3D really shows the transparent sacks of fluid well. Some of those pimples look particularly fluid-filled, too. The sacks are definitely fluid filled. They are very fragile, and you can see in the one that's collapsed, left side, how thin the walls are. I'm not sure what you mean by "pimples". 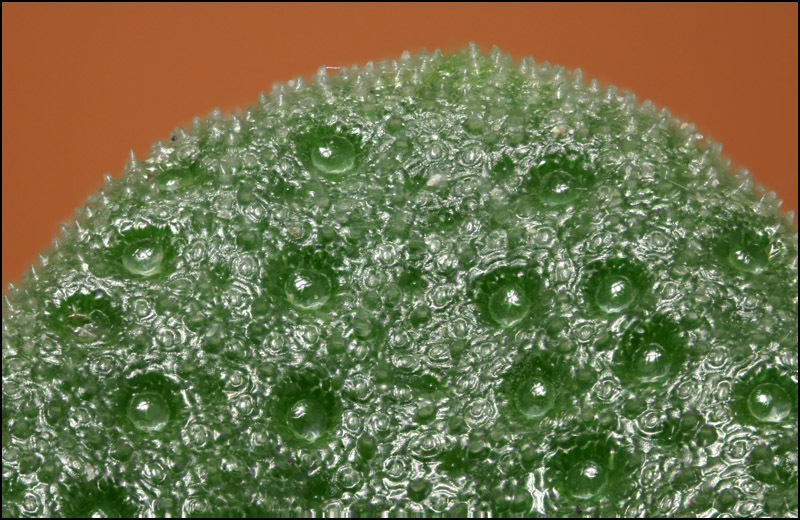 If you're talking about the conical bumps of which 100's can be seen along the margin, then those are not fragile and seem no more fluid filled than any other plant tissue. Some of them do look transparent, but I think that's a stacking artifact due to the look-around effect of a wide aperture lens. The stereos works great again! 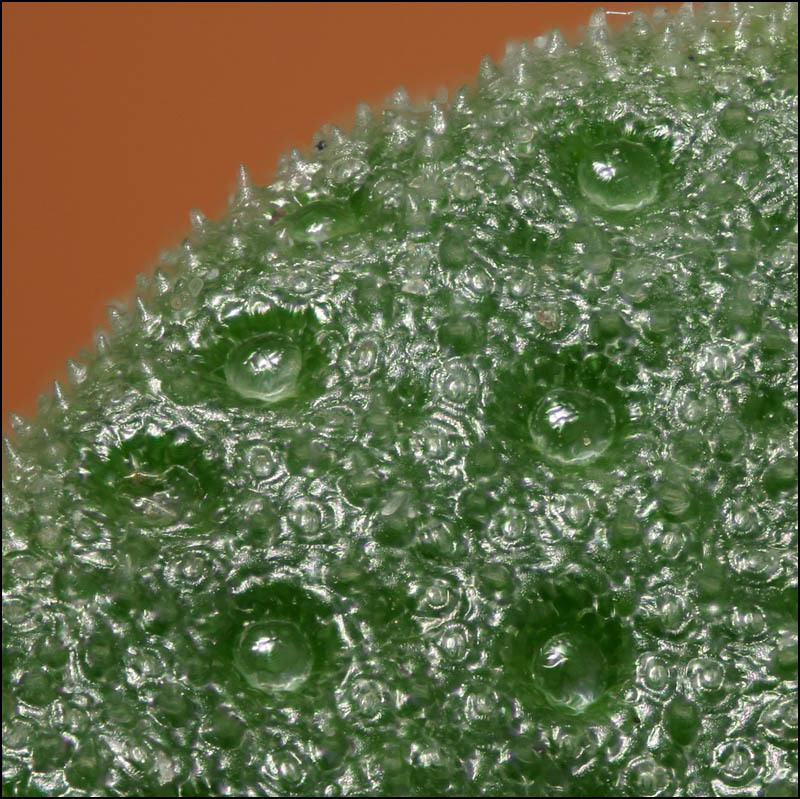 Are we looking on the underside or the upper side of the leaf? Upper side. The lower side is similar, a bit less shiny, more hairy, so many sacks. This is a decorative thyme, by the way. The thyme in our garden for seasoning has a structure that is similar but less obvious, with colors and textures that make it harder to photograph. I first noticed these structures last spring on the garden thyme. But then, I did not see them as fluid filled sacks, more as flat orange colored scales. I think I was actually seeing dried-up sacks from the previous fall, but I'm not sure. Perhaps I will shoot another series when I see them again.
" More info about the thyme leaf and what's in "
but one 3cm north east of it is somehow obscured. Here are examples of the two problems. Look-around. The three images are a) one original frame, b) DMap, c) PMax. Missed between focus steps. Four consecutive frames, sweeping back and forth. Note that the right-hand cone is never sharp. This stack was shot by eyeballing half-ticks on a dial marked in 0.001", 100 tics per rotation. So the focus step was nominally 0.0005" = 12.7 microns. But DOF for 10X NA 0.30 is only around 7 microns. So I'm guaranteed to have some OOF gaps between slices even if I actually made all the steps precisely, which I didn't take any great pains to do.